Does a $500 dollar bill really exist? You’re right to be skeptical. A bill with that high of a denomination sounds crazy. I mean, can you imagine walking around with one piece of paper that can buy you 500 items from the dollar menu? Is there a $500 dollar bill? Yes, there is a $500 dollar bill and it’s completely real. Though the bill as been out of circulation since 1945, it’s still legal tender. If you had one, you could use it buy your groceries. But I wouldn’t recommend it. The actual value of a $500 bill is much larger than the face value of the bill. 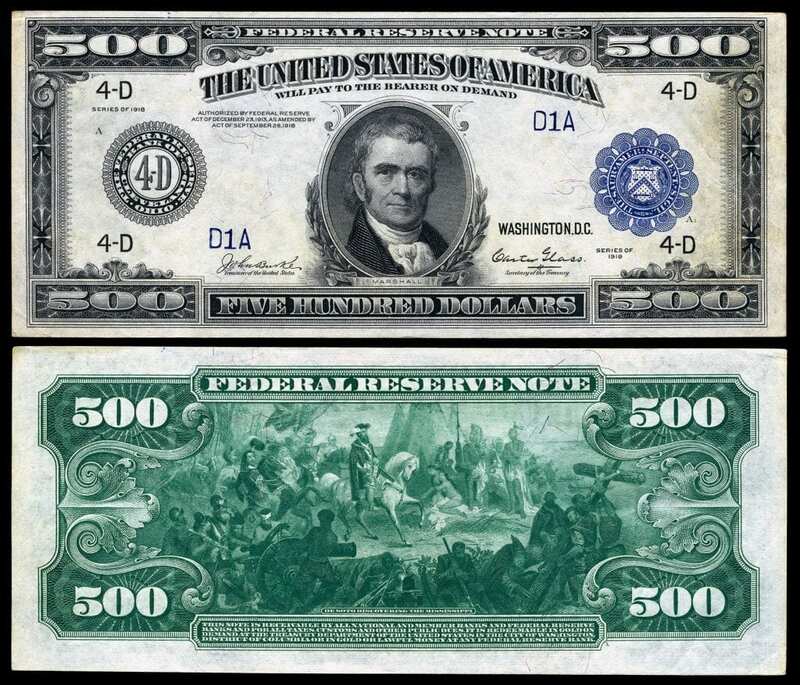 The first federal reserve note worth $500 was printed in 1918. 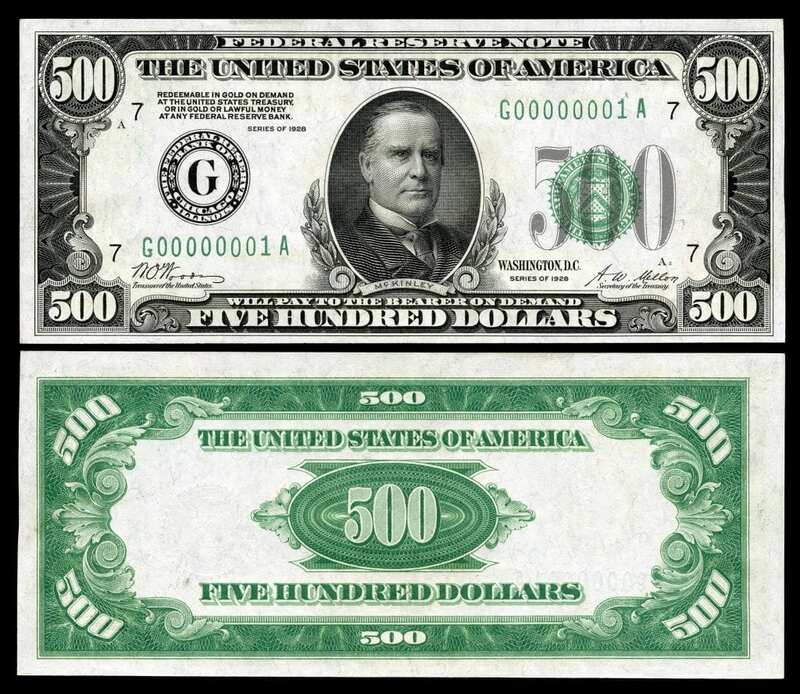 The next series of bills was printed between 1928 and 1934.
Who is on the $500 dollar bill? William McKinley is the president on the $500 dollar bill. But, as I mentioned, there are two series of five hundred dollar notes. John James Marshall, the fourth Chief Justice of the United States, is on the 1918 series of the $500 dollar bill. William McKinley is on the 1928-1934 series. The front of this series bill is adorned by the face of John James Marshall. He was the Chief Justice from 1801 to 1835. This makes him the longest-serving Chief Justice. Fun fact: he was also classmates with the future president James Monroe. The backside of the bill depicts an image of de Soto discovering the Mississippi. This series of the bill actually depicts a president. The 25th president of the United States, William McKinley is on the $500 dollar bill. Can I still get a five hundred dollar bill from the bank? Though the $500 dollar bill is still considered legal tender, you won’t get one at the bank. In 1969, the Federal Reserve officially discontinued high-denomination bills. This included the $500 dollar bill, the $1,000 dollar bill, the $5,000 dollar bill, and the $10,000 dollar bill. Whenever a bank receives one of those bills, they’re instructed to send it in for destruction. Of course, if you bring a $500 dollar bill to the bank to deposit, they’ll honor the value but you’ll lose the bill. Why did they stop making these bills? Originally the purpose of high denomination bills was to help banks and the federal government make large transactions. With the introduction of the electronic money system, the use (and need) of the bills disappeared. Along with the higher potential for counterfeiting and use for illegal activities, it’s very unlikely that high-denomination bills are ever going to come back into circulation. What is a $500 dollar bill worth? Because of the rarity of a $500 dollar bill, its real value is much greater than its face value. The value of a collectors item is really whatever a collector is willing to pay for it. A bill in good condition is worth more than one in bad condition. The 1934 $500 dollar bill that depicts William McKinley is the most common series, which means it has the least value. Even still, these bills are worth between $600 and $1,500 depending on their condition. The rarer, 1918 $500 dollar bill is worth considerably more – between $5000 and $10,000 depending on condition. Where can I buy $500 dollar bill? Unfortunately you won’t probably find a “$500 dollar bill for sale” sign at your local pawn shop. If you’re looking to buy one of these five hundred dollar bills your best bet is to contact several online dealers to see if they have any for sale. You can also try looking on eBay. However, it’s definitely riskier to buy a $500 dollar bill from eBay than a trusted and certified dealer. Yes, a $500 dollar bill exists and is still technically considered legal tender. It’s now worth more than $500 dollars because of how rare the note is. It’s valued between $600 – $1,500 for the common series and $5000 – $10,000 for the rarer series. It’s original purpose was to help facilitate large transactions between banks and federal institutions. Interested in other high denomination bills? Did you know there exists a $1,000 dollar bill, a $5,000 dollar bill, a $10,000 dollar bill, and even a $100,000 dollar bill?